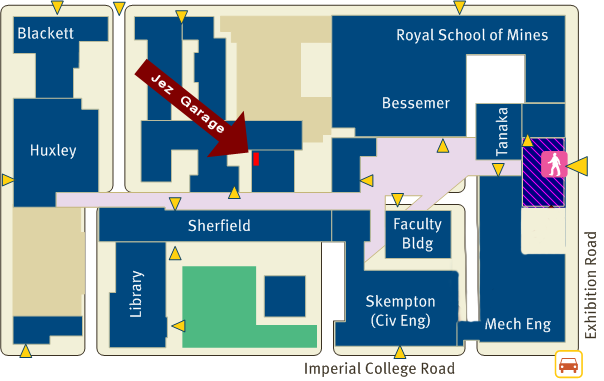 Our current garage is situated underneath the ACEX extension (Chem Eng), behind the Royal College of Music (see map below). The garage is at street level and is accessed by walking along the road (shown in lilac on the map). Leave the Sherfield Building at road level on the North side then turn right to head East along Ayrton Road. The garage is located on the second turning on the left. There is usually something happening on a Wednesday afternoon during term time if you’d like to visit. For more info please send us an email jez@imperial.ac.uk.